Q What is the prevalence of musculoskeletal disorders? A In England 16.5 million people have back pain, 8.5 million people have peripheral joint pain, and 4.4 million have moderate or severe osteoarthritis.1 Musculoskeletal disorders are more common in women than men at all ages, and prevalence rises with age so that about one-third of the population over the age of 65 have a chronic musculoskeletal disorder. A 2010 UK Health Dataset shows that people live with musculoskeletal disorders for more years of their lives than any other condition, taking into account the degree of impairment of quality of life.2 In addition, looking at disability-adjusted life years, which is a composite index combining the years lived with disability with the years lost to life due to premature death due to disease, the impact of musculoskeletal disorders is actually comparable to that of both cardiovascular disease and cancer (see Figure 1, below). Disability-life years represents the sum of years lost to life through premature death due to disease, and the loss of quality of life for those living with a long-term condition. Category 'Other' includes: diarrhoea, lower respiratory infections, meningitis, and other common infectious diseases (3%); transport injuries (2%); digestive diseases, self-harm, and interpersonal violence (1%); cirrhosis of the liver (1%); neonatal disorders (1%); nutritional deficiencies (<1%); HIV/AIDS and tuberculosis (<1%); other communicable, maternal, neonatal, and nutritional disorders (<1%); neglected tropical diseases and malaria (<1%); maternal disorders (<1%); forces of nature, war, and legal intervention (<1%). Reproduced with permission from NHS Ealing Clinical Commissioning Group. Musculoskeletal health in Ealing—chapter for Ealing joint strategic needs assessment 2014. NHS, 2014. Available at: www.ealingccg.nhs.uk/media/9881/Ealing_JSNA_MSk_Health_pre-pub_2014-09-06.pdf using data from Murray C, Richards M, Newton J et al. UK health performance: findings of the Global Burden of Disease Study 2010 Lancet 2013; 381 (9871): 997–1020. Q What is the impact of a musculoskeletal disorder on the individual? A Almost all musculoskeletal conditions are painful and many impair function. A patient's ability to participate fully in life is affected—they may have to modify their activities or work as a result of a musculoskeletal disorder. There is also a mental health aspect; about 1 in 4 patients who are seen in primary care with chronic musculoskeletal pain have major depressive symptoms.1 The important point about this is that if the underlying mental health problems are treated, then the musculoskeletal pain improves as well. Q What is the impact of a musculoskeletal disorders on healthcare providers? Q Why was there a need for service redesign in Ealing? A The redesign started about 20 years ago, when all musculoskeletal services were provided in secondary care. There was no GP access to physiotherapy; patients would be referred to a consultant and could be waiting for up to a year before seeing a physiotherapist. In the 1990s, under GP fundholding, a small number of GP practices in Ealing bought physiotherapy services. Following the demise of fundholding, a community musculoskeletal service was set up using the same pot of money, but it then had to cover the whole of Ealing, and not just the few leading fundholding practices. 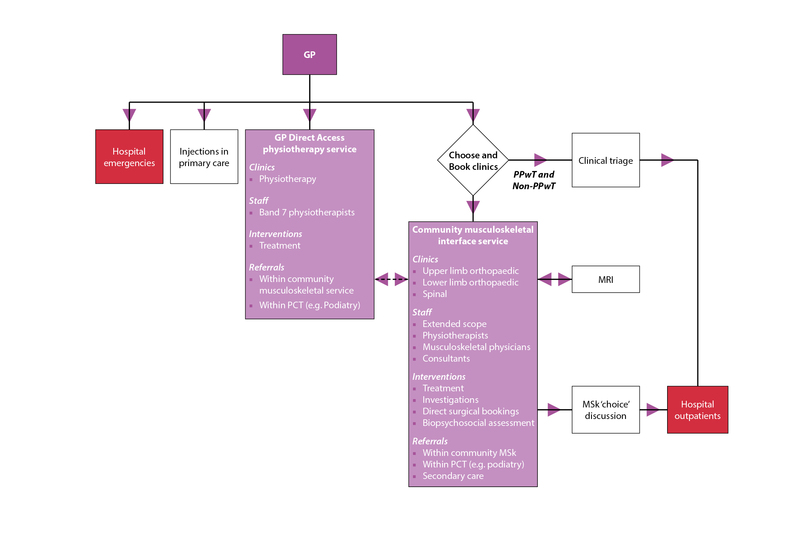 By phase 2 of the service redesign in 2008, a 'See and Treat' model was implemented that included a central booking service where a GP could refer patients to either physiotherapy, an interface service, or to hospital (see Figure 3, below).3,4 When there was no triage service in the area, it was up to the GP to choose how to use this community service, which led to a fourfold difference in referral rates between different GPs in neighbouring practices.5 Since then, the primary drivers behind changes to the service have been aimed at reducing the unwanted variation in referrals, and, of course, reducing waiting times. Through implementing the option of referral to the GP direct access physiotherapy service and the interface service, the current target aims for 90% of patients to be seen by a physiotherapist or musculoskeletal physician within 4 weeks of seeing their GP. Q What are the main advantages of the interface service in Ealing? A Once the GP refers the patient to the interface service they start their treatment with whomever they see first. This means that the people at the front end of the interface service need to be able to carry out treatment; all the extended scope therapists can start initial management, and all the musculoskeletal physicians are also trained osteopaths so they can start managing therapy, exercise programmes, and they can prescribe and inject. Patients are able to receive the appropriate treatment sooner through direct GP referral to physiotherapy, with escalation to orthopaedics if progress is not made. In a See and Treat service the patient starts their definitive treatment sooner and there is less onward referral to hospital. The healthcare utilisation in the year following treatment is significantly lower than in the triage model. With the triage model, patients may be referred back and forth between physiotherapy and secondary care; with the See and Treat service, the patients start and finish their treatment with the therapist they see first. A policy has also been introduced whereby magnetic resonance imaging (MRI) is only accessible through the interface service, with no direct access for GPs. As a result, not only are MRI scans assigned more appropriately, but the patients have quicker access as a result of reducing unnecessary MRI referrals. Some secondary care consultants also work in the interface service in the community once a week, providing a consultancy service to the extended scope therapists and musculoskeletal physicians if a second opinion is required. Q What obstacles did you face when implementing the service redesign? A The main obstacle to implementation of the service redesign was acquiring stakeholder buy-in from the acute trusts providing consultants in a community setting, the service commissioners, and the GPs who might refer to the service. To overcome this, a core strategy group was set up comprising clinicians and managers representing the commissioners and the community musculoskeletal provider, as well as GP and secondary care representatives. The role of the group was to map out what good care looks like and to break down this competitive internal market to achieve the common goal: providing better care for patients. Clinicians would then go back to their respective commissioners and providers with key messages from the core strategy group, to ensure that everyone's efforts would be synchronised towards achieving that goal. In terms of GP stakeholders, it was more a question of engagement. General practitioners would be given plenty of advance warning about the service changes, a chance to look at clinical scenarios (how they would do things differently), and the opportunity to feed in to the service redesign. 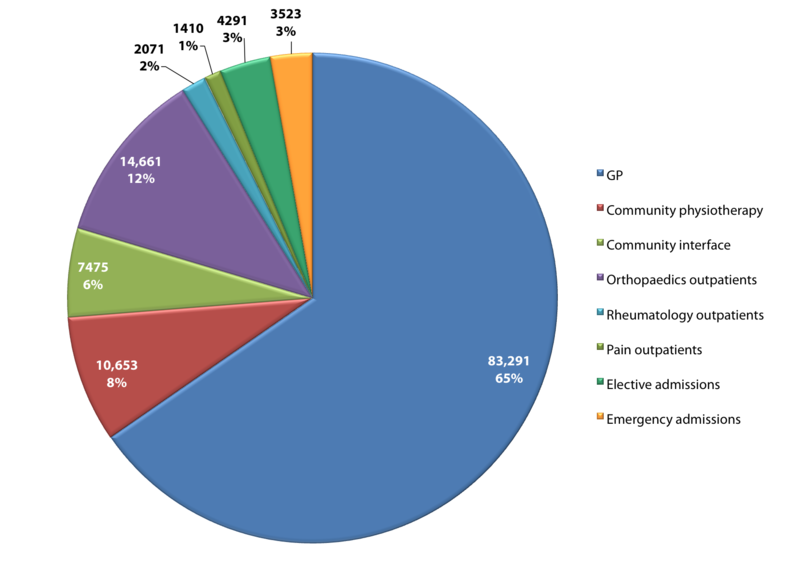 There has been a significant reduction in the variation of referral rates, achieved through an extensive GP education programme, which has been running for about 5 years, improving GPs' confidence in managing musculoskeletal conditions. Q What training did GPs receive to aid implementation of the service? GPs and registrars visiting the interface service and observing the clinics, undertaking clinical skills training, and going through clinical scenarios on a one-to-one basis. Q How were these changes funded? A The bulk of the savings were produced by decommissioning GP access to MRI scanning; in Ealing there are currently savings of a quarter of a million pounds a year as a result of this. Moving patients from outpatients to community services on a community block contract where they are seeing therapists instead of consultants is also contributing to a reduction in costs. Overall the service redesign is currently breaking even. Q How willing are providers to switch to this community tariff? A Hospital providers receive more on Payment by Results than they do under any community tariff, so there was no incentive for them to participate in service redesign. The associated problem, which is unique to London or any large area, is that there are eight CCGs and nine providers within about a 7-mile radius. If a single provider agrees to provide the community service, they will lose money because other work will go to the other providers. In a less densely populated area where there is a single large provider covering one or two CCGs, it might be easier to negotiate changes. A Most CCGs are looking at trying to integrate health and social care across multiple morbidities, by implementing whole systems service redesigns. In this scenario musculoskeletal services would interlink with services for frail elderly, people with comorbidities, and mental health. The focus may move more towards prevention; by encouraging patients to exercise they will not only be treating their musculoskeletal condition, but they will also be treating other possible conditions such as high blood pressure, cardiac disease, respiratory disease, and it may also lead to improvements in sleeping and mental health. Q How do you plan to move forward with this redesign in Ealing? A In phase 4 of the redesign in Ealing we are looking at how we can integrate musculoskeletal services with the rest of healthcare, and promote prevention of other conditions through social care. Several years ago, five of the eight CCGs in northwest London (Central London, West London, Hammersmith and Fulham, Hounslow, and Ealing), formed a working partnership called the CWHHE Collaborative. Following a service review by CWHHE there is now a clinical network, which comprises commissioners and providers across the five CCGs and nine providers, as well as patient representatives providing a user's perspective. The outcome of the review has been to develop a service application, which all the CCGs and providers have signed up to. Each CCG is now looking at how it can move its current services towards that new service specification—very similar to what is already in place in Ealing. The two things that are currently missing from the service model in Ealing are a community pain service and a community rheumatology service and we are hoping these will emerge from the redesign. Q What would be the key points of advice you would offer other CCGs wanting to implement a similar service in their area? stakeholder engagement—the clinical network model is very good because clinical networks cut across the 'purchase–provider' split and also allow innovation and free thinking. And they endure the test of time. Murray C, Richards M, Newton J et al. 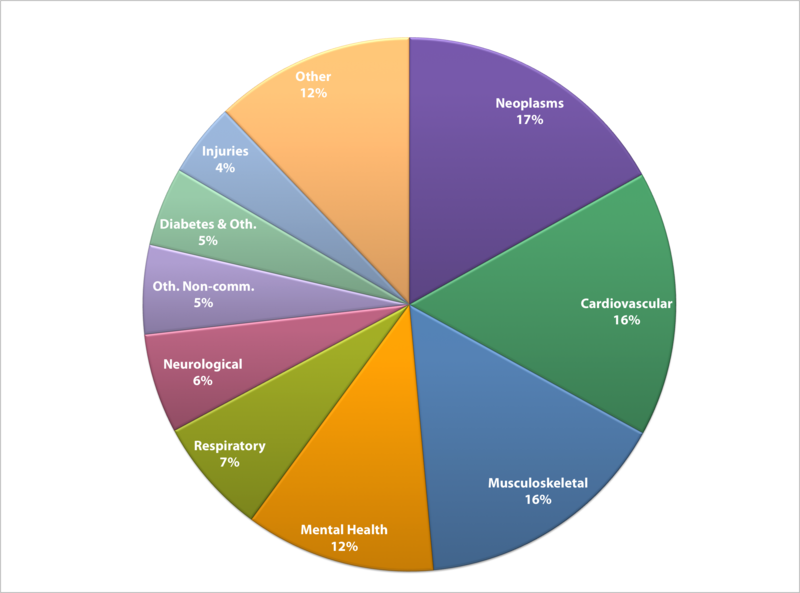 UK health performance: findings of the Global Burden of Disease Study 2010. Lancet 2013; 381 (9871): 997–1020. Bernstein I. Integrated musculoskeletal service design by GP consortia. London J Prim Care 2011; 4; 16–26. Bernstein I, Parmar M. Musculoskeletal services, demand management recommendations 2012–13. NHS Ealing, May 2012. Goh L, Samanta A, Cavendish S and Heney D. Rheumatology curriculum: passport to the future successful handling of the musculoskeletal burden? Rheumatology 2004; 43: 1468–1472.